In Girl Perfect, one of the most important relationships in Elin’s life is with her much-loved mare, Hebe. Like many young teenagers, Elin is beginning to explore a life independent of her parents. The hacks and idle wanderings Elin enjoys with her horse provide the perfect opportunity to taste genuine freedom outside the home. The bond Elin shares with her horse is strong and unconditional, and Elin draws enormous comfort from knowing that Hebe doesn’t judge her on her appearance or the way she talks. Just as importantly, Elin knows she’s a good rider; in the saddle her cleft lip and palate is no encumbrance, and she exalts in the feelings of mastery and competence that riding provides. These are just some of the benefits that riding and the companionship of horses can bring to people, especially those with low confidence or self-esteem. 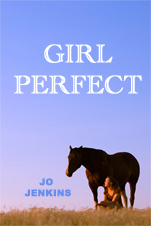 Since writing Girl Perfect, which drew on my own recollections of happy times spent in the saddle as a girl, I’ve become aware of a growing body of evidence pointing to the benefits of horses and riding to human well-being. In February this year, Tracy McVeigh, writing in The Guardian, drew together various bits of evidence of the efficacy of ‘equine therapies’, which are becoming increasingly popular. In addition to the benefits of mastering new skills through riding (which has underpinned the work of charities like Riding for the Disabled for many years now), psychologists and other mental health professionals are starting to recognise the value of horses’ particular character to promoting well-being. McVeigh notes that not only do horses seem to pick up on the way people are feeling, mirroring their emotions and responding accordingly, but there is also some neurological evidence that being around horses can induce calm and affect human brain activity. There are a growing number of examples of how these ideas are being put into therapeutic practice. Probably the largest equine-assisted therapy provider is Eagala, which operates in many countries around the world. Then there’s The Horse Boy Foundation, which aims to help young people with autism to develop their communication skills through sensory work with horses and back riding. Another remarkable example is found in South Africa, where the Montrose Foundation runs an ‘equine assisted youth at risk programme’, helping youngsters whose lives are threatened by alcohol and drug dependency to learn to handle difficult situations through close contact with horses. Anyone who has ever looked after a horse, or ridden regularly, knows how special the emotional ties are between mount and rider. In Girl Perfect, Elin certainly does. And as evidence grows in support of equine therapies, it looks like the many benefits riding can bring will become ever more available in therapeutic contexts.